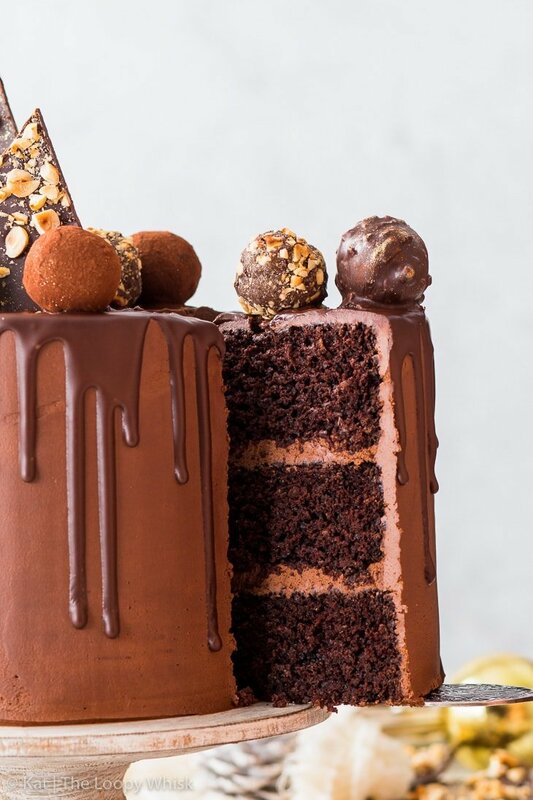 On a scale of deliciousness from 1 to 10, this vegan chocolate truffle cake is off the charts. 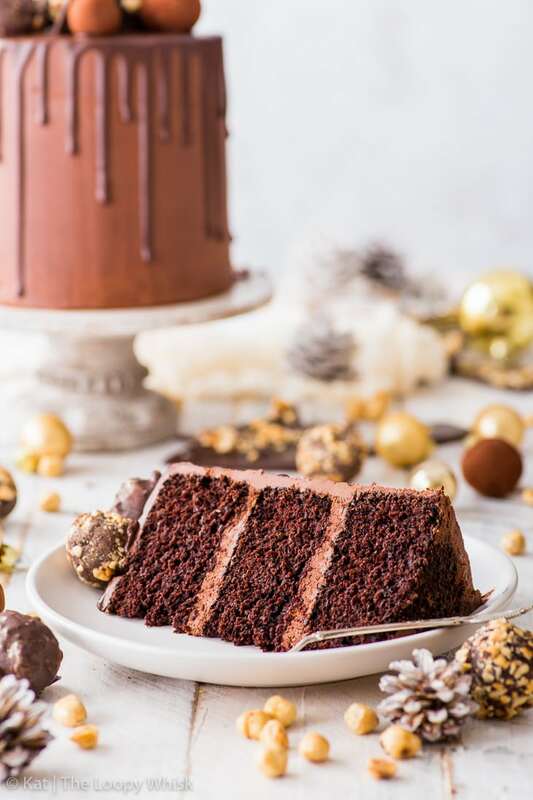 With melt-in-the-mouth chocolate sponges, fluffy vegan chocolate frosting and absolutely stunning decorations, it’s the perfect showstopper for all occasions. 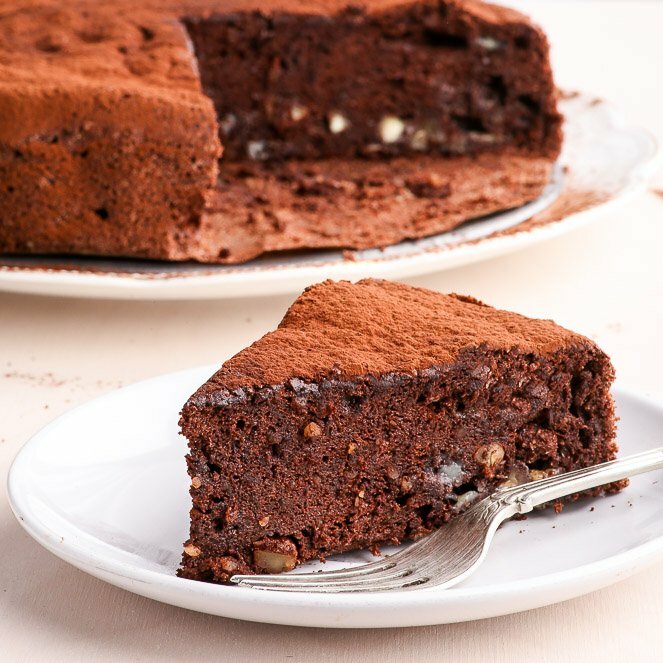 In fact, this may very well be the ultimate vegan chocolate cake. This is my dream cake. 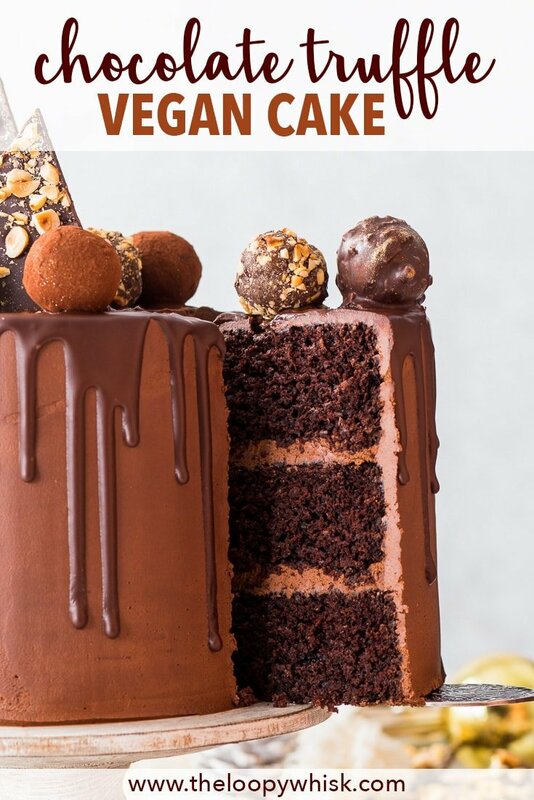 Correction, this is every single chocoholic’s dream cake. What with the melt-in-the-mouth chocolate sponges, fluffy chocolate frosting, luscious ganache drip, hazelnut-studded chocolate shards AND too many truffles to count… that’s hardly surprising. This vegan chocolate truffle cake means business. It’s not just playing around. 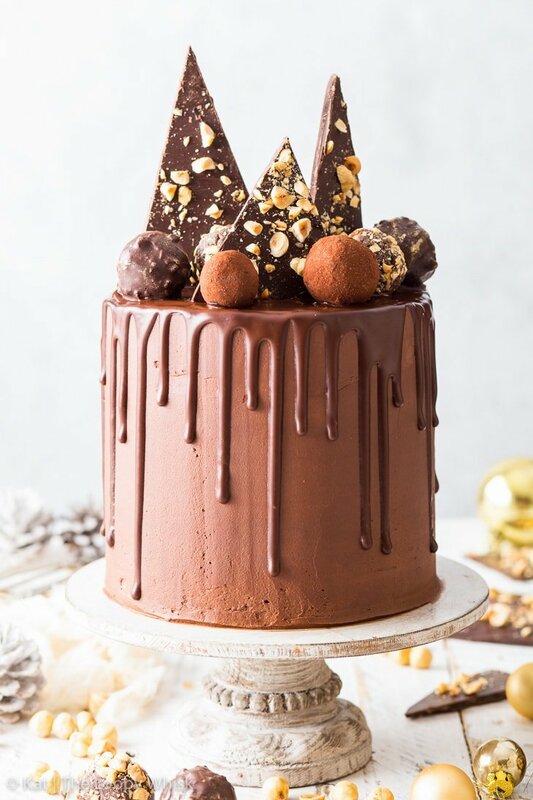 It’s taking the meaning of “chocolate cake” to a whole new level, all the while looking festive and luxurious and fancy. Oh, and it’s VEGAN. Mind. Blown. What’s even better: each and every moist chocolatey crumb, dollop of chocolate frosting and decadent chocolate truffle is made exclusively from Aldi UK products! 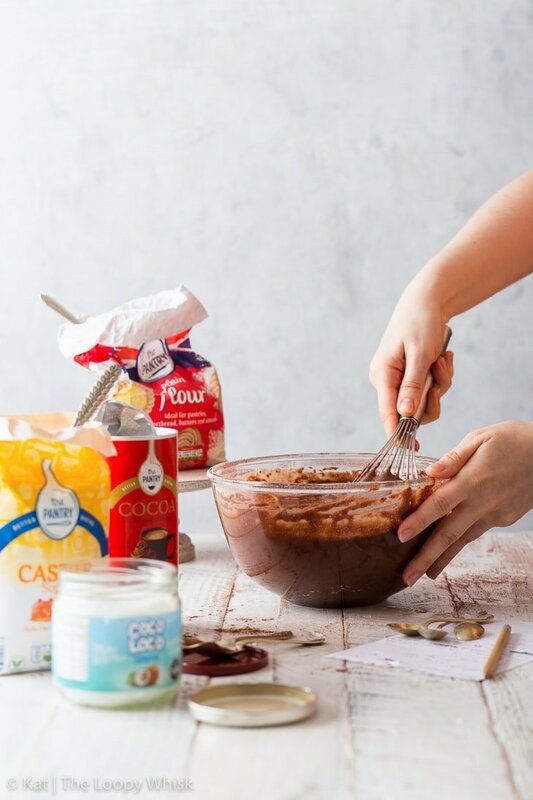 I’m not exaggerating when I say I’m a huge fan of Aldi shops – they’re my go-to store for everything from cocoa powder and sugar, to the coconut milk that I use in every single one of my coconut cream-based vegan frostings. Plus, their Moser Roth chocolate brand is simply to die for. Seriously: SO. GOOD. 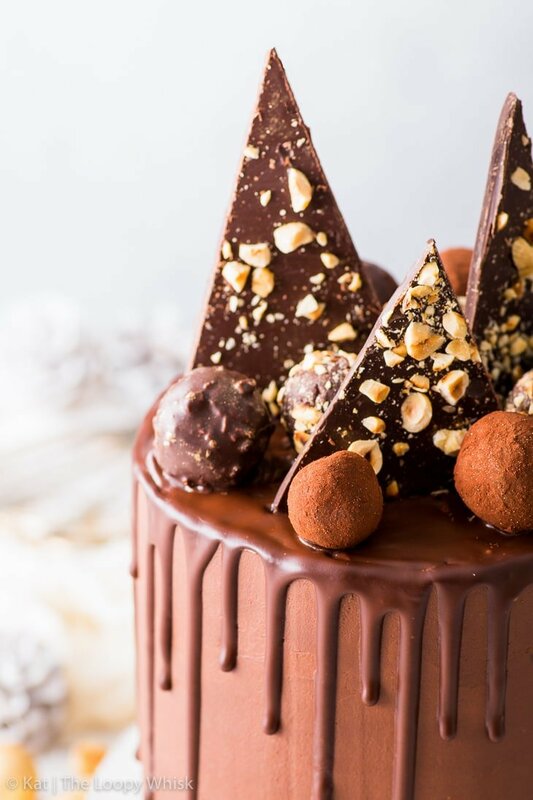 And it shines in all of its glory in this gorgeous, delicious, mouth-watering chocolate truffle cake. First, we have the moist, delicate vegan chocolate sponges. They basically taste like hot chocolate in cake form, which is just as delicious as it sounds. 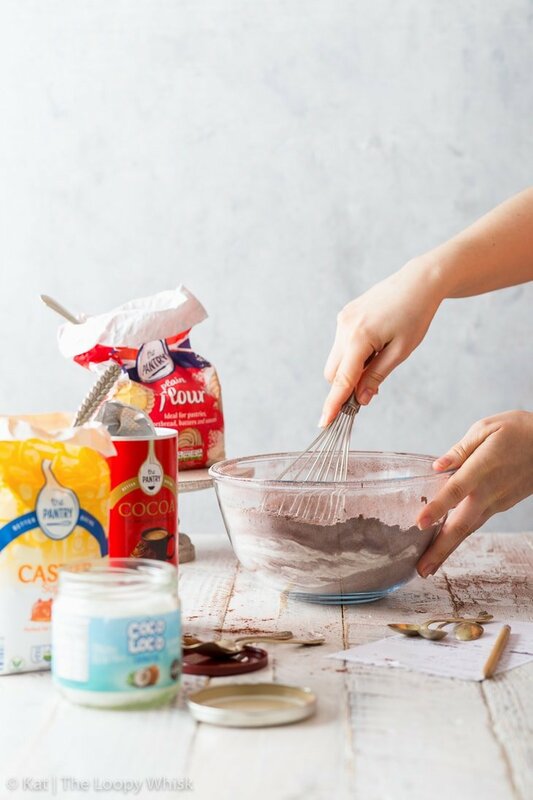 The vegan chocolate frosting has coconut cream as its basis – but you can’t actually taste any coconut in the final product. It’s all chocolatey goodness as far as your eyes can see… or your tastebuds can savour. It wouldn’t be a proper chocolate truffle cake without a luscious chocolate ganache drip. It’s just a fact – accept it, and revel in the awesomeness that is shiny chocolate ganache. The decorations are over the top – unapologetically so. There are the hazelnut chocolate shards, made from tempered dark chocolate and toasted hazelnuts. They’re equal parts pretty and delicious (because as we all know, chocolate + hazelnuts = BFFs). Also on the decoration front: decadent chocolate truffles, rolled in cocoa powder, toasted chopped hazelnuts and even dipped in some more chocolate. Because more chocolate is always better. Now, you might think that while this chocolate truffle cake is superduperawesome, it’s outside of your skill range. Not at all! It’s actually super simple to prepare, and I have proof – a.k.a. step-by-step photos, which will make whipping up this cake even easier! 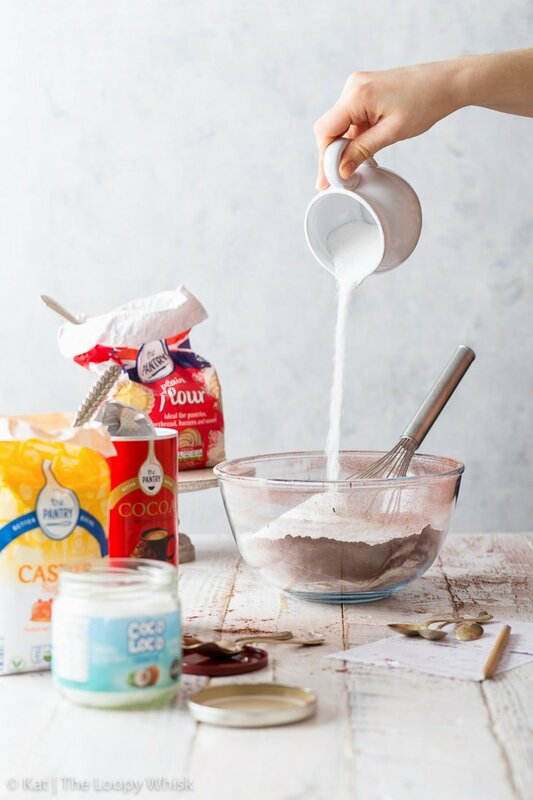 Listen, whenever you begin any baking project – the first thing you should do is get your ingredients ready and within reach. If you’re being extra organised, measure them all out beforehand, so you don’t – for instance – forget to add the sugar. It happens. Don’t ask, it’s not one of my favourite memories. First up, let’s sift together the flour, baking powder, baking soda and cocoa powder. Bonus points if you do it from great height and with flair. Add in the sugar and salt, and whisk well to combine all the dry ingredients evenly. Next up: the wet ingredients. Let’s start with the almond milk. You can, of course, use other non-dairy milk alternatives. Combine the almond milk with melted coconut oil, warm water and about one tablespoon of lemon juice. 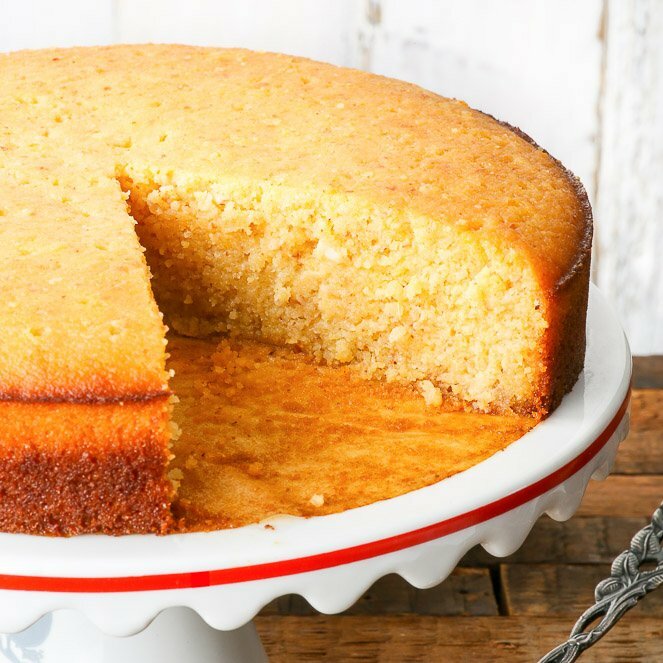 The lemon juice will give the raising agents an extra kick, making the sponges even more fluffy, while the water ensures that the cake stays nice and moist. 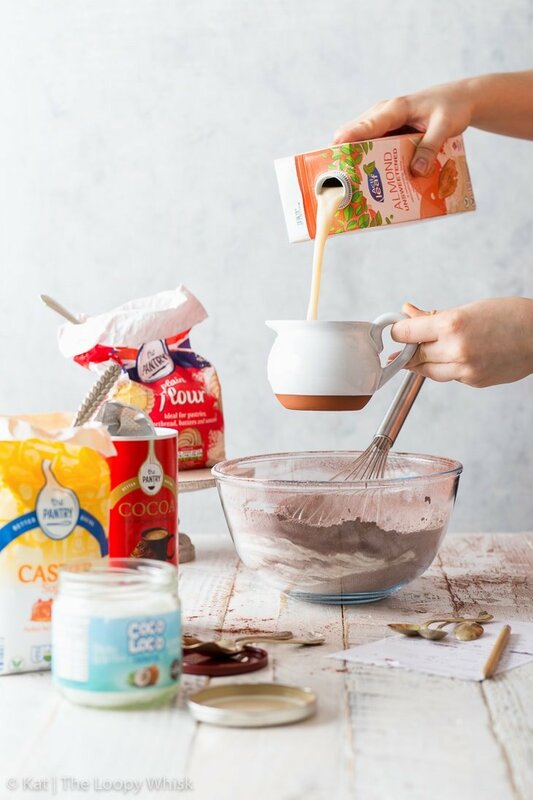 Then, it’s the same old story of whisking the cake batter until smooth, all the while gazing at it longingly because it looks so luscious and tempting. Resist. I believe in you. Finally, we’ll transfer the cake batter into some lined round cake pans and bake until an inserted toothpick comes out clean. You know the drill. First, we make a lovely chocolate ganache by pouring hot coconut cream over chopped dark chocolate. Then, the slightly cooled ganache is combined with more coconut cream, as well as icing sugar and vanilla extract. This is all whipped up until smooth and airy. I won’t bore you with the same-old details of how to layer a cake and frost it. We’re all pros at this by now. Once the outside of the cake is frosted and smooth, it has to go into the fridge for about 15 minutes to half an hour, so that the outside is nicely chilled and ready for decorating. And, yes, you’ve guessed it: decorating is the best bit. 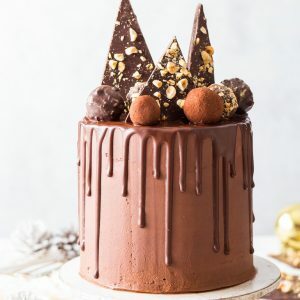 The easiest way to create the perfect chocolate ganache drip cake it to use a squeeze bottle. This gives you the control to create the beautiful drip without breaking a sweat. 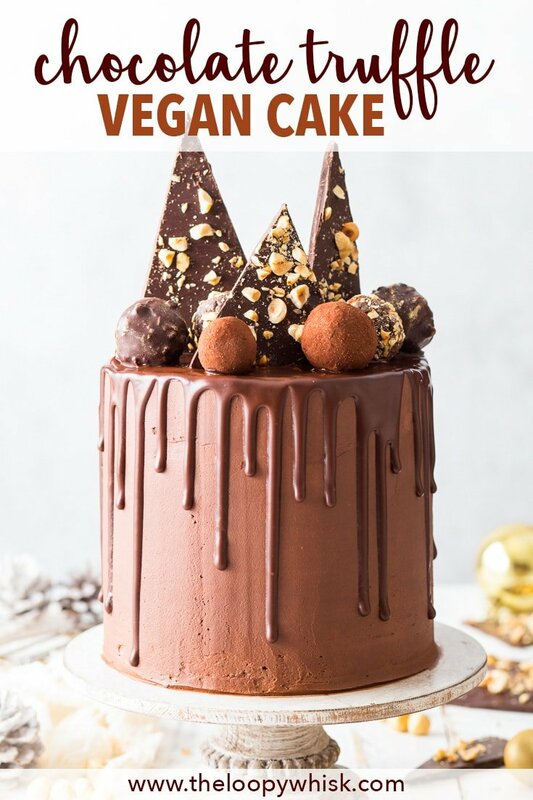 I actually prefer to first create the drip round the sides, and only then fill in the top of the cake with a drizzle of chocolate ganache that I smooth out with an offset spatula. 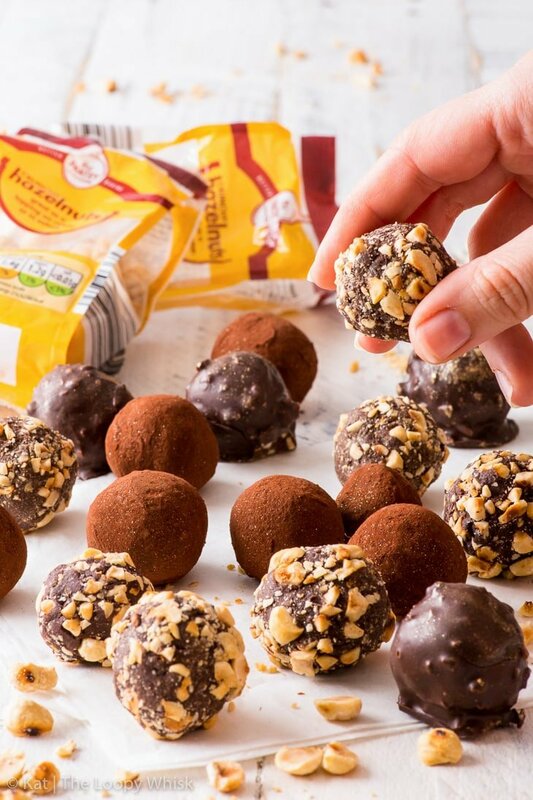 The vegan chocolate truffles… well, good luck with not eating them all by the time you start decorating the cake. These little bites of intense chocolate flavour are dangerous – in the best possible way. 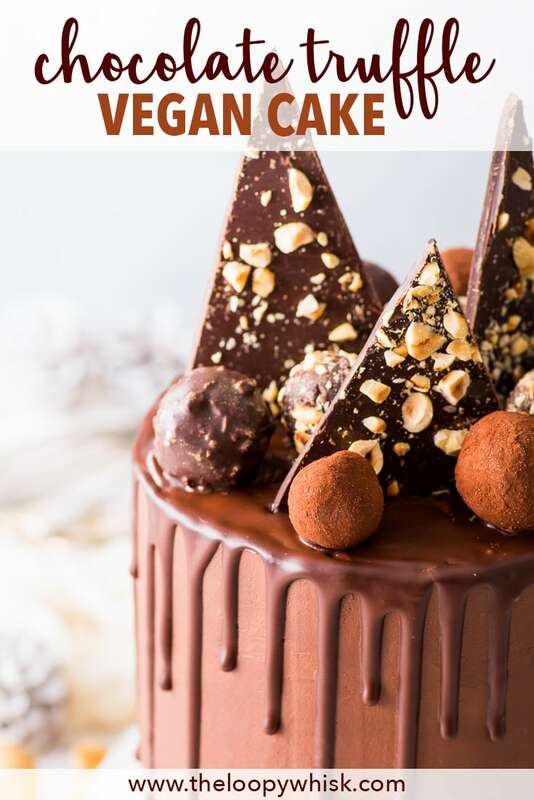 And to add some more height to this delicious vegan chocolate truffle cake (and make it even more impressive): hazelnut chocolate shards. Making the chocolate shards is easy. 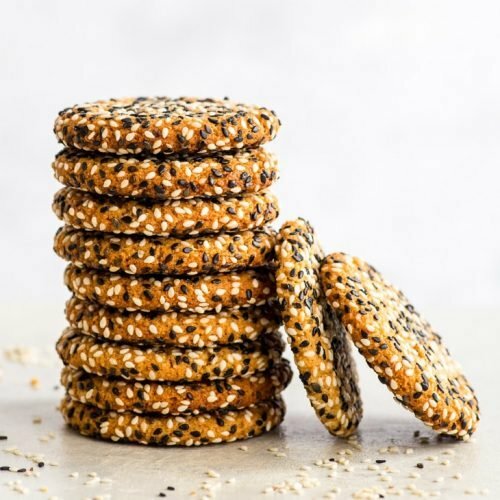 Not eating them all in 5 minutes flat… not so much. All you have to do is temper some chocolate (relax, it’s easier than it sounds), spread it out and scatter some chopped toasted hazelnuts on top. And trust me, toasting the hazelnuts is not only recommended… it’s pretty much obligatory. Thank me later. 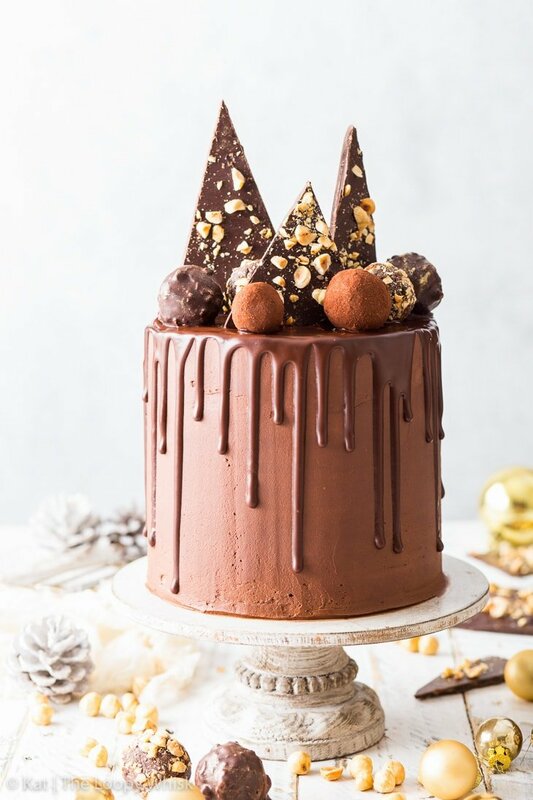 Once the chocolate has set and firmed up, you can cut it into pretty triangles, that look absolutely stunning on top of the cake. IS THIS CAKE AS GOOD AS IT LOOKS? Ummm… yes. A hundred, no, wait – a bazillion times YES!!! Actually, it’s even better (if that’s even possible). 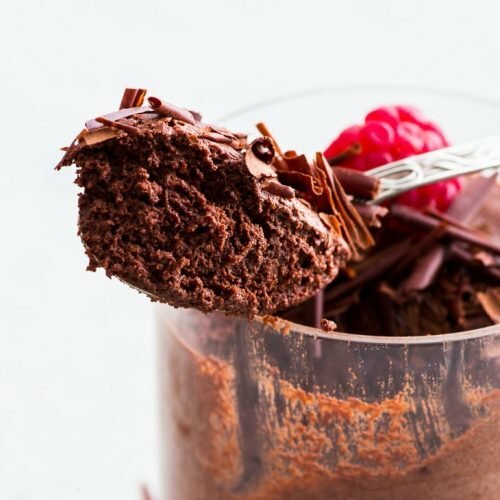 This vegan chocolate truffle cake has it all. 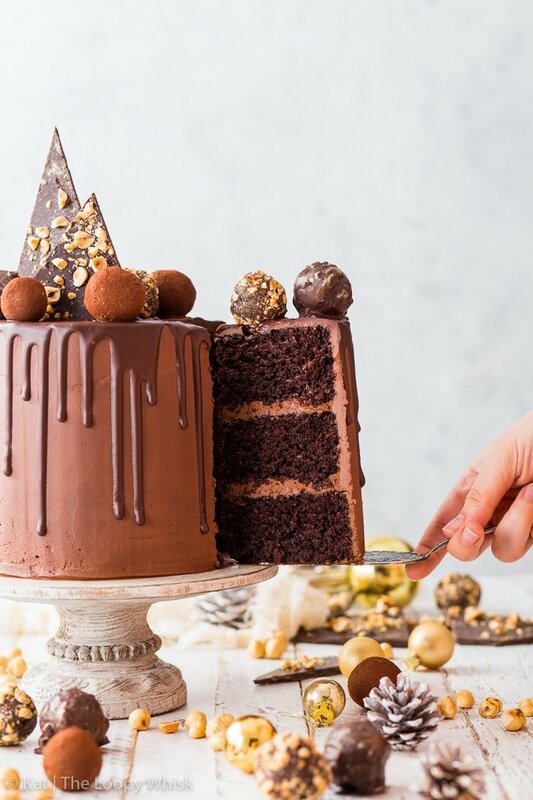 The abundance of chocolate, the contrasting and complementing textures, the WOW factor… on a scale of deliciousness from 1 to 10, this cake is off the charts. What’s more, based on detailed feedback from my friends and colleagues “it doesn’t taste vegan at all”. 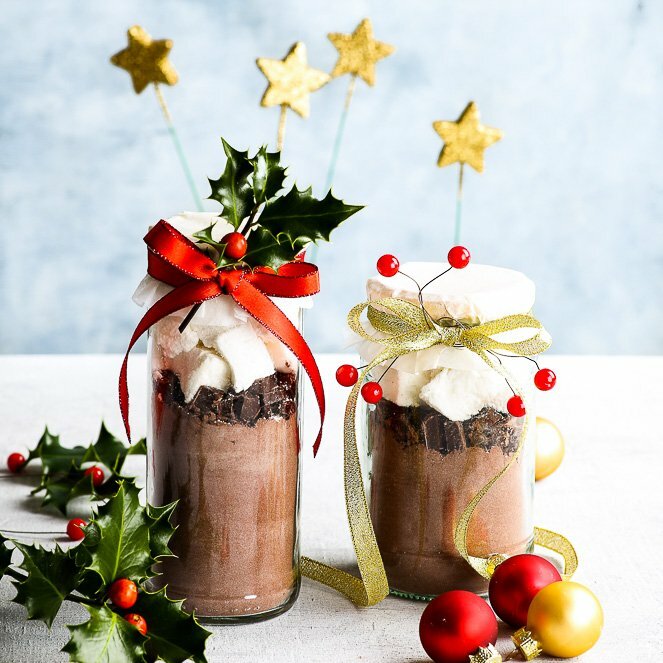 That’s to say: it’s super decadent, too beautiful for words and you should totally make it this holiday season. Or tomorrow. Just… make it as soon as possible. And if you’re feeling generous: share it. You’ll find that all of a sudden you’re everyone’s absolutely favourite person. Yes… chocolate does have that effect on people. Place the chopped dark chocolate into a heat-proof bowl. 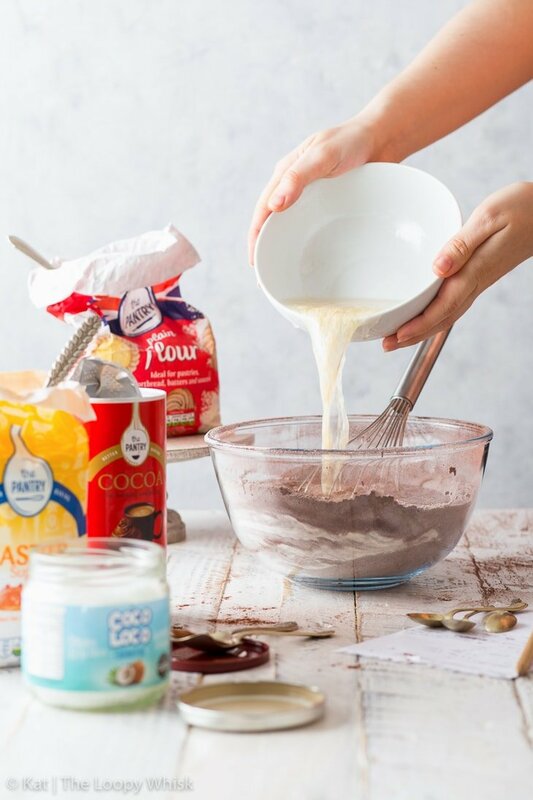 Heat the coconut cream and coconut oil together until only just boiling (either on the stove or in the microwave), then pour it over the chocolate. Allow to stand for 2 - 3 minutes, then stir well until you get a smooth glossy ganache. 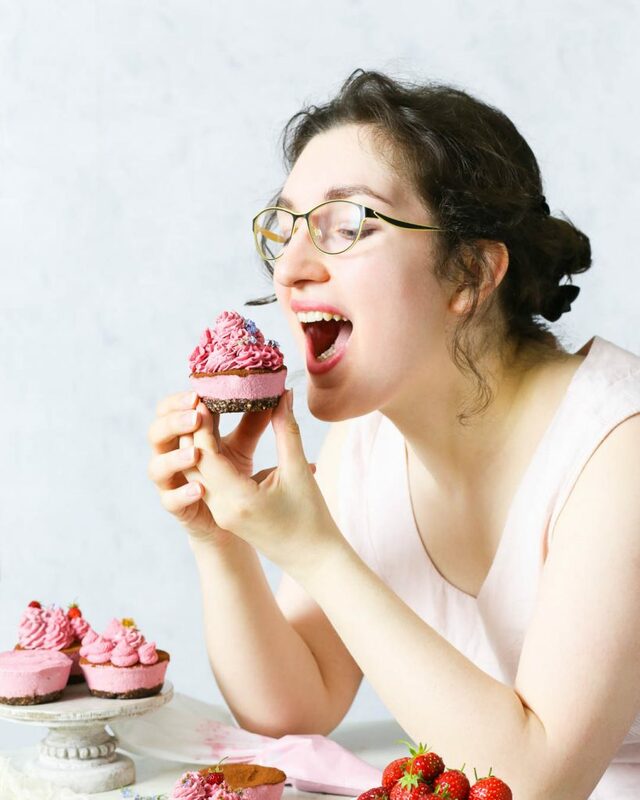 Taste the ganache – if you want it to be sweeter, add some icing/powdered sugar. Allow to cool first at room temperature, then in the fridge for about 30 minutes, until you can easily form truffles. 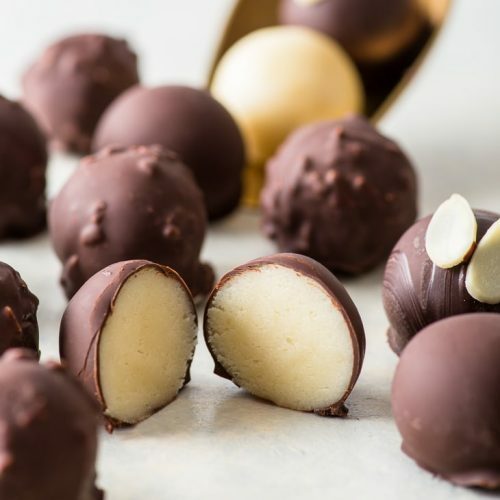 Make truffles of different sizes (this will make the cake decorations more interesting), and roll them in chopped hazelnuts or cocoa powder, or dip them in melted chocolate. 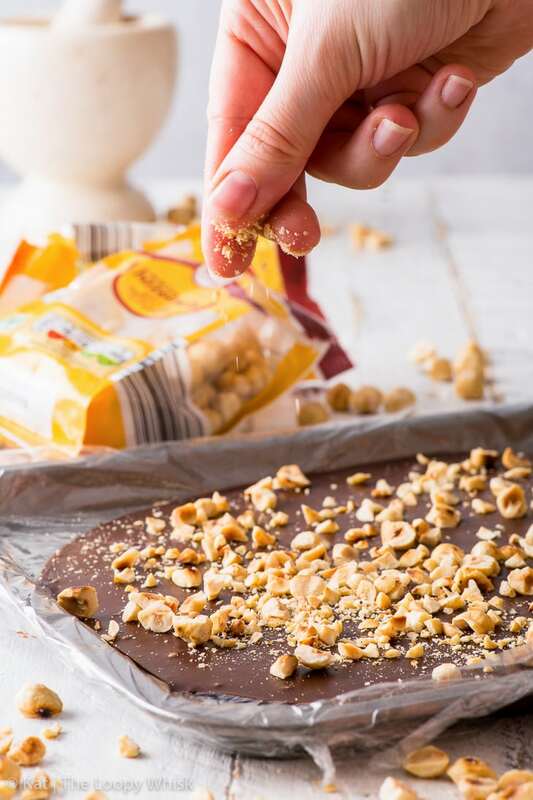 For a crunchy chocolate shell, mix some of the chopped hazelnuts into the melted chocolate. Cover a baking sheet or a shallow baking tray with a smooth layer of cling film. In a heat-proof bowl above a pot of simmering water, melt 2/3 of the chopped dark chocolate until it reaches 130 ºF (55 ºC). Remove from heat and mix in the rest of the chopped chocolate. Stir gently until the chocolate completely dissolves – this will lower the temperature of the chocolate. 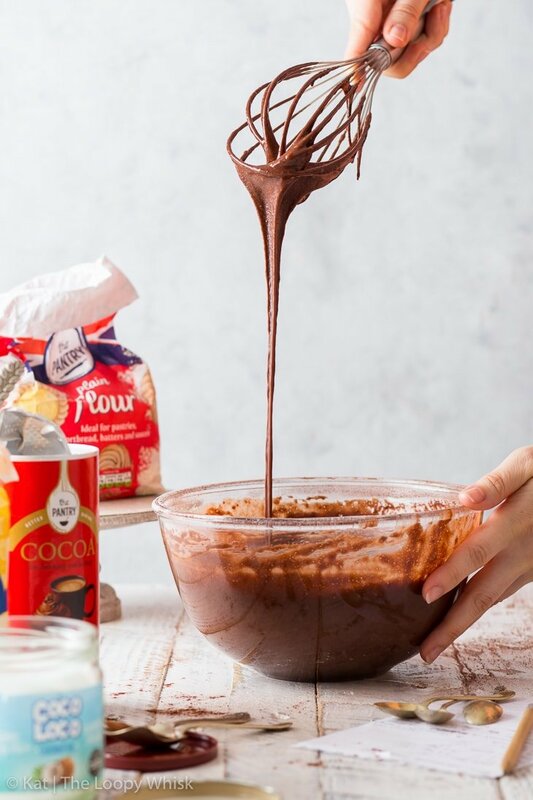 Heat the chocolate over the pot of simmering water up to a temperature of 90 ºF (32 ºC), then pour it immediately onto the baking sheet/tray lined with cling film. Gently spread it into an evenly thin layer by tilting the baking sheet/tray in all directions. Scatter the chopped toasted hazelnuts onto the chocolate and allow to set. If the chocolate has been tempered properly, it will set within a few minutes at room temperature and will have a glossy shine. Don't refrigerate the chocolate, otherwise it will "bloom" and get a greyish-white tinge on the surface. Allow the chocolate to firm up for at least 1 - 2 hours (while you make the rest of the cake). Then, cut it into triangles that you will use to decorate the cake (see post for pictures). Pre-heat the oven to 355 ºF (180 ºC) and line three 6 inch round cake tins with greaseproof/baking paper. You can bake the sponges in differently sized tins, but this will affect the baking times. 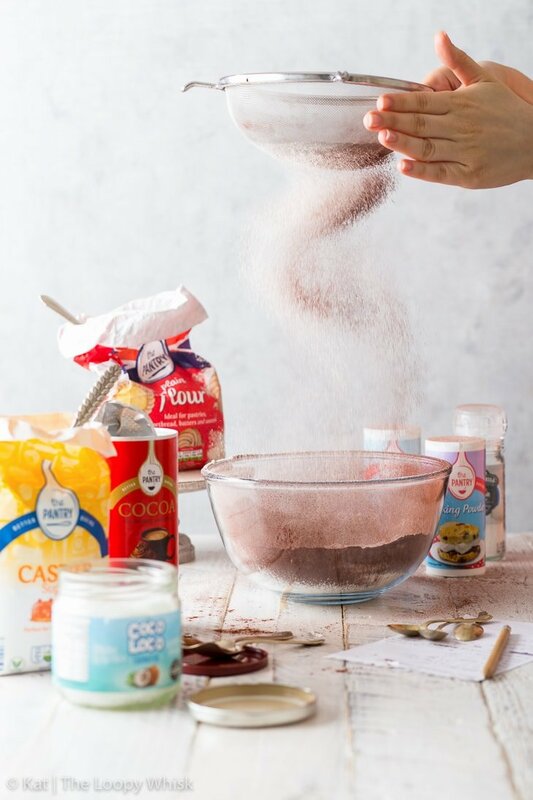 Sift together the flour, baking powder, baking soda and cocoa powder. Add the sugar and salt, and whisk well so that the dry ingredients are evenly distributed. Combine the almond milk (or other non-dairy milk of choice), melted coconut oil, warm water and lemon juice. Pour the wet into the dry ingredients and whisk well until you get a smooth cake batter. Distribute the cake batter evenly between the three lined cake pans. Bake in the pre-heated oven at 355 ºF (180 ºC) for about 40 minutes, or until an inserted toothpick comes out clean. Allow to cool in the pans for 10 minutes, then turn out onto a cooling rack to cool completely. Place the chopped dark chocolate into a heat-proof bowl. Heat 1 cup of coconut cream until only just boiling (either on the stove or in the microwave), then pour it over the chocolate. Leave it to stand for 2 - 3 minutes, then stir well until you get a smooth glossy ganache. Allow to cool. 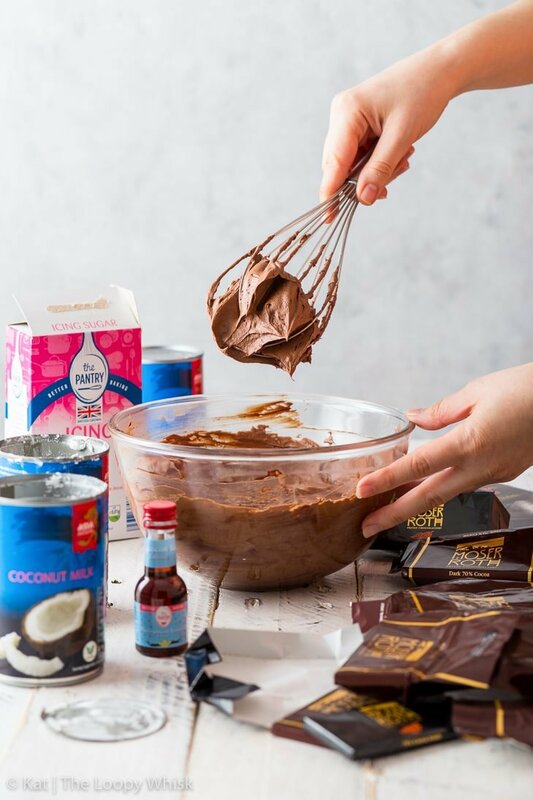 Combine the ganache with 1 cup of coconut cream, and whip (either by hand, using a hand mixer with the double heater attachment, or a stand mixer with the whisk attachment) until fluffy. The frosting will get a bit lighter in colour as air is incorporated. Add the icing/powdered sugar and vanilla extract, and whisk until evenly incorporated into the frosting. Place the chopped dark chocolate into a heat-proof bowl. Heat the coconut cream until only just boiling (either on the stove or in the microwave), then pour it over the chocolate. Allow to stand for 2 - 3 minutes, then stir well until you get a smooth glossy ganache. Layer the sponges and frosting on a cake stand of choice in the order: sponge - frosting - sponge - frosting - sponge. Then, frost the outside of the cake with the remaining chocolate frosting, creating an even smooth layer. Chill the cake in the fridge for about 30 minutes. Check the consistency of the chocolate ganache. It should be runny enough to drip, but not too hot (otherwise it will melt the frosting). If it's too thick, heat it up briefly in the microwave. For the easiest (and prettiest) drip, transfer the chocolate ganache into a squeeze bottle. 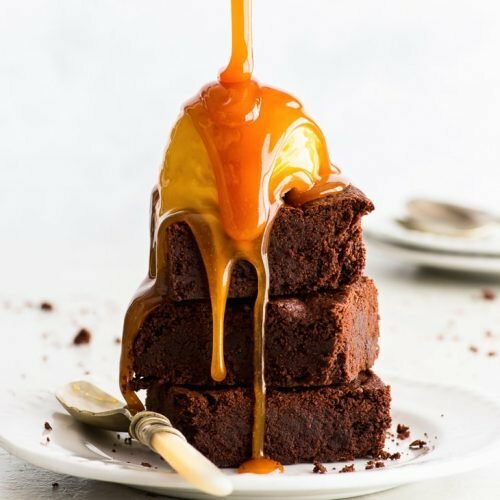 Create the chocolate drip: first allow the chocolate ganache to gently run down the sides, then fill out the top of the cake by drizzling on more ganache and smoothing it out with an offset spatula. 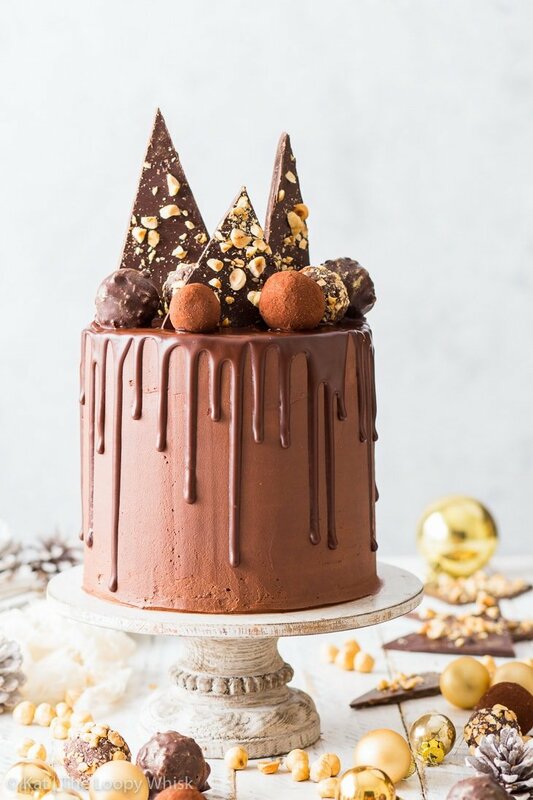 Use the hazelnut chocolate shards and the truffles to decorate the top of the cake. The cake keeps well in a closed container or wrapped in cling film, in the fridge for 3 - 4 days. 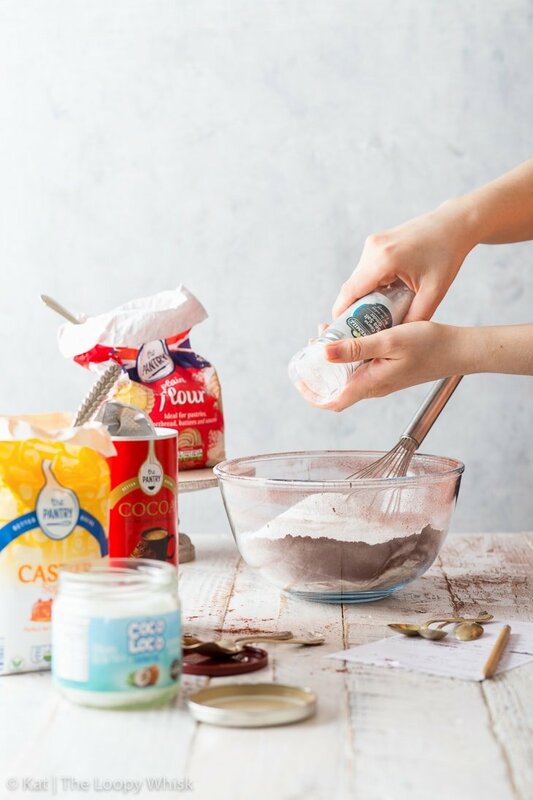 You can get coconut cream by putting coconut milk (with a high coconut content and without too many stabilisers/preservatives, I recommend the Aldi UK Asia Specialities brand) into the fridge for a few hours or overnight – without shaking! The coconut milk will separate into coconut cream (that you'll need in this recipe) and coconut water (which is great in smoothies). I tend to get, on average, about 3/4 - 1 cup of coconut cream per a can of high quality/high coconut content coconut milk. 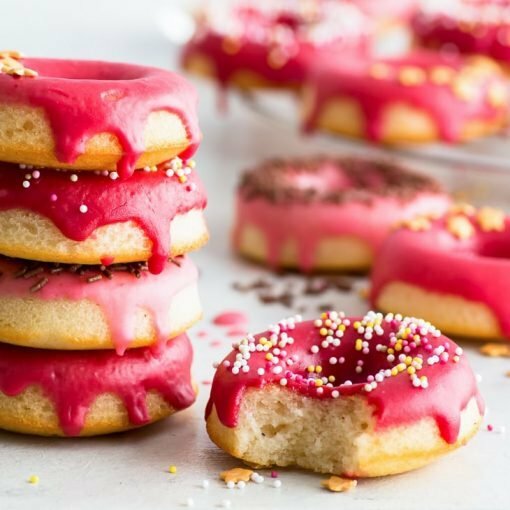 Looking for more delicious vegan recipes? Thank you so much for this, I made it for Christmas and it was amazing! I’m sure it would! That sounds like a wonderful idea!